Bedrooms tend to be a part of the property that we look to keep clean and tidy for the sake of our own wellbeing. We’ve all been given tips on how to clean our bedrooms in the past, especially as it means a lot more to us now than it did in our teenage years! Cleaning a bedroom can be reasonably straightforward and it usually comes about as a result of shifting things around or relocating wardrobes, beds and shelving. Of course, there’s a difference between picking up all your loose clothes and actually cleaning your bedroom carpets, upholstery and curtains, so here’s a step-by-step guide to follow should you be keen on making your bedroom a cleaner, tidier and safer space to be in. 1. Start by setting out the amount of time you actually have to complete each task, as this means you’ll get things done without distraction and without losing focus. You could possibly give yourself 2 minutes for each cleaning phase. 2. Now it’s time to get hold of all the supplies and products you’ll need to achieve a fresh, clean bedroom space. You’ll likely need a rubbish bag, some cleaning products, a dustpan and a broom. 3. Before acquiring your set of tools, pick up anything that’s lying around or getting in the way of your cleaning job. This could be anything that’s not in its associated place in the room or just something that needs throwing away. 4. Use your bed as a base for things you don’t need or don’t have somewhere to put. Your bed can be changed once cleaning is finished, so throwing everything that’s lying around on the bed will free up the more important areas of the room, such as the floor, the mantelpiece, the desk and so on. 5. Start vacuuming your carpet or alternatively mop your wooden or laminate flooring. You can move on to the next step after vacuuming but should probably leave your mopping solution to dry out for a few minutes if you were cleaning wooden floor. 6. With the floors tidy, you can start sorting out the things you’ve put on the bed. Find spaces for them or throw things out until there’s nothing left to sort. 7. With the bed empty and your belongings sorted, you can change your bed fabrics and dust any desks, tables, mantelpieces and shelves. Sweep up the dust or vacuum for a second time, regardless of the type of flooring you have. That should be that! 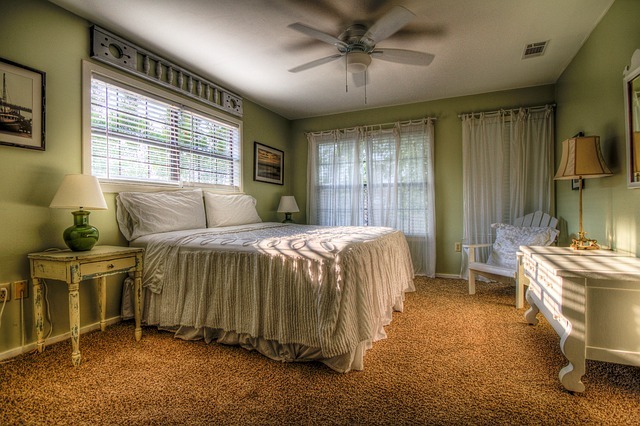 A clean bedroom contributes to a healthy sleep, especially if you’ve got dust, allergens and other underlying dirt present in your bedroom.